September 5th is a big day for Nokia and Microsoft fans alike. Nokia is all set to reveal it’s range of Windows Phone 8 devices, starting with the Nokia Lumia 920 PureView and Nokia Lumia 820. Apparently, the Lumia 920 will be the flagship Lumia device with a dual core 1.5 GHz processor, 1 GB of RAM, 4.5 inch HD screen and 32 GB storage capacity, expandable to another 32 GB via MicroSD slot. The icing on the cake is the PureView camera technology, according to some sources, it won’t come with a 41 megapixel sensor, but an 8 megapixel one with advanced image stabilization and quality features. The Lumia 820 will come with the same processor and RAM, but 8 GB of inbuilt storage, expandable upto 32 GB via MicroSD slot and a 4.3 inch HD screen. No mention of PureView camera here though. 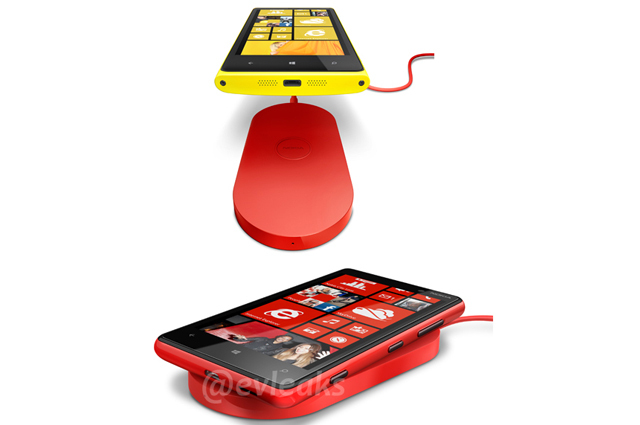 There’s something different in store, the Nokia Lumia 920 and 820 wireless charging pad has been leaked! It’s been confirmed that both the Nokia Lumia 920 and 820 will both be chargeable wirelessly via a charging pad. All you have to do is line up the device to the inductive contacts and it charges. It’s also been said that both these phones will support the Qi Wireless Power Standard, so other devices and charging pads from third party manufacturers will also be compatible. Apart from this, the Nokia Lumia 820 is said to come with interchangeable panels a la the Nokia Lumia 710. Again, no word on this for the Lumia 920. What we have heard, is that the wireless charging functionality will be built in for the Lumia 920, while Lumia 820 owners will have to purchase an additional panel to use it. Again, this information has been leaked by EVLeaks, which is quickly becoming the bane of manufacturers by revealing their products before the official announcements. Sure, we lose the surprise element, but it doesn’t hurt to know what to expect either. Let us know what you think about the Nokia Lumia 920 and 820 wireless charging pad leak via the comments below! Do you think the wireless charging pad is a valuable addition to the new Nokia Lumia range? Can’t wait to get my hands on it..
Wireless charging already existing is some other phones, but when its on Nokia, that’s something we should appreciate. Indeed, it was misleading but no harm intended.